A few days ago, I entered the world of Sous Vide. If you ever watched an episode of Top Chef, or any other prestigious food competition, you might have heard the term “sous vide” and perhaps know a little bit about it. 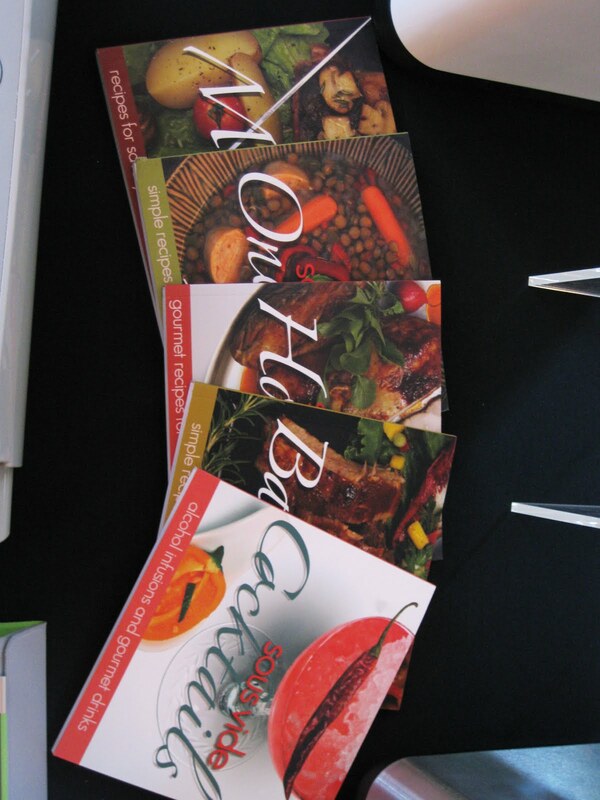 Here’s is your chance to learn more information and see the expansive variety of food that can be sous vide. Let’s start from the beginning. 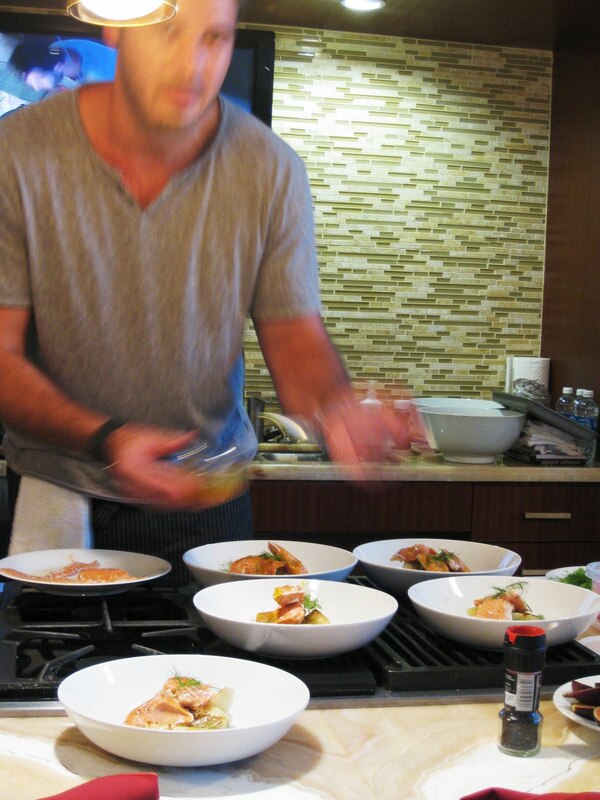 This was yet another food community event at Myra’s sponsored by Sous Vide Supreme (a local Seattle company) with guest Chef Sharone Hakman (as seen on Master Chef). 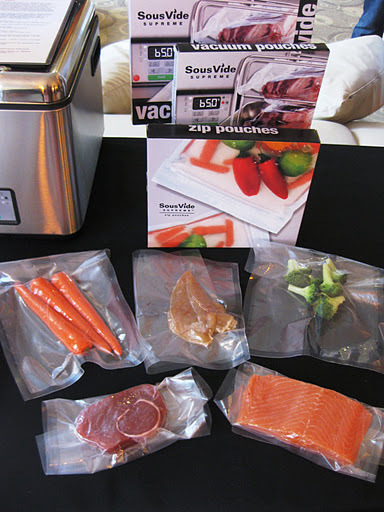 Like many cooking terms, the term sous vide is French and is translated to “under vacuum.” The food is vacuum packed in heavy-duty food grade plastic bags and then submerged in water and cooked under controlled temperature. Thus, the ability to set it, and forget it (as the time goes by, the temperature continues to be constant, thus the food does not overcook or dry out), which might be reminiscent to a crock pot, but the differences probably stop here. 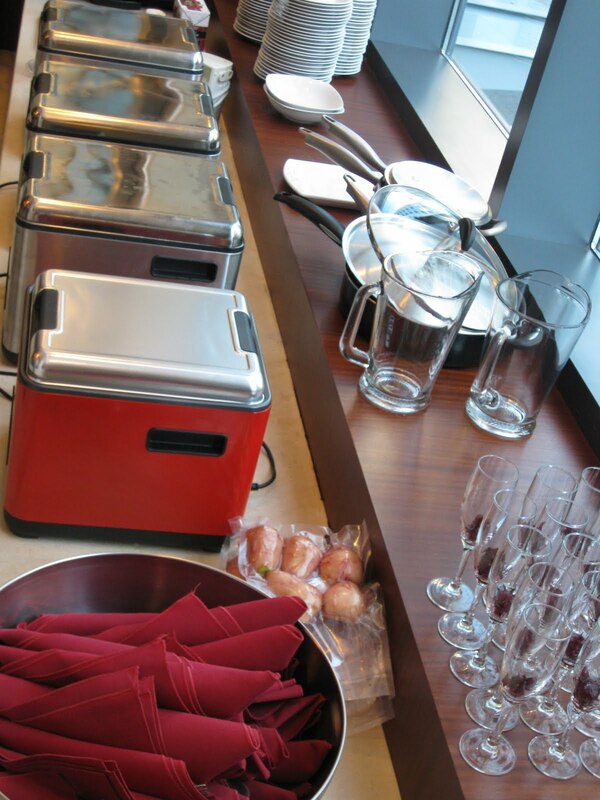 What better way to really understand the sous vide process and its benefits than to taste the food!? We were in for a treat: the 6 course tasting menu, plus the Wild Hibiscus Spritzer to start. The first course was Wild King Salmon with Fennel, Radish and Turmeric Butter. 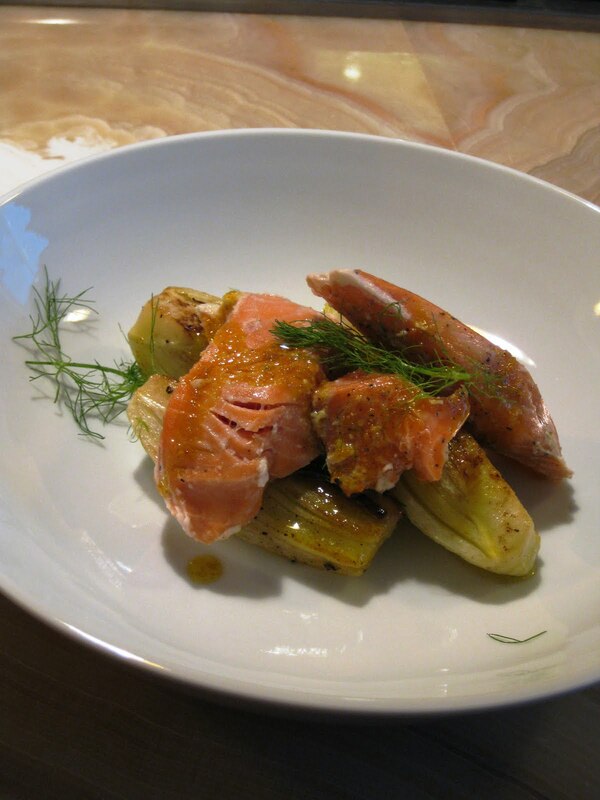 Both fennel and the salmon were cooked in a sous vide machine. The beauty of this, regardless of whether you like your salmon slightly pink or completely cooked through, you are in control! Just set your temperature and the machine will do the rest. For extra flavor, Sharone added sliced lemon and dill along with the salmon inside the vacuumed bag. For the fennel, which has an anise flavor that mellows out and sweetens as the fennel cooks the desired doneness was al dente. Prior to placing the fennel on the plate, Sharone seared it on the hot pan to add an extra texture and flavor dimension. 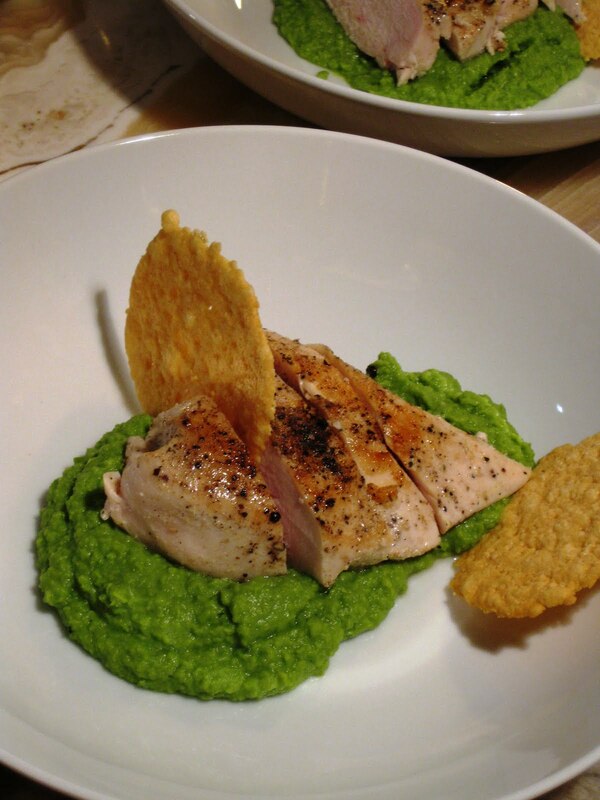 On to the next course: Tender Chicken Breast with English Pea Puree and Crispy Parmesan. Wouldn’t you agree that cooking chicken is difficult? 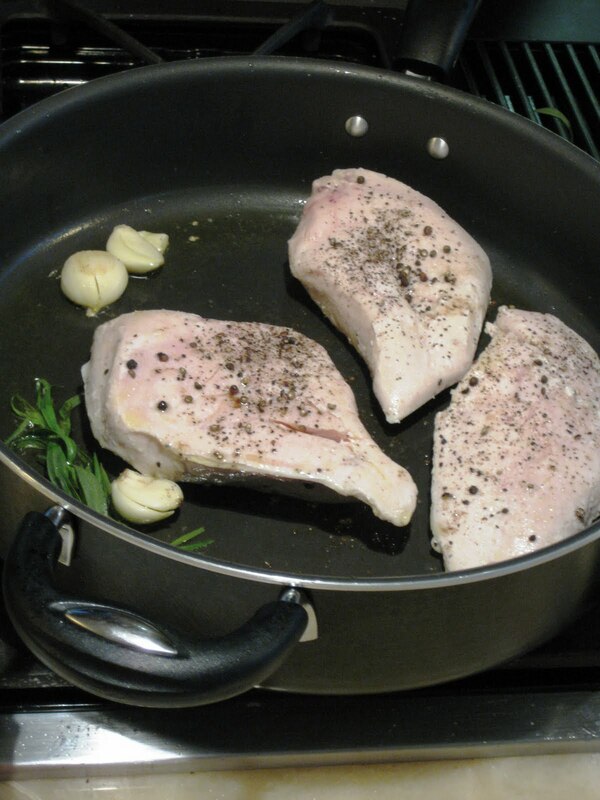 Trust me, you don’t want a medium rare chicken breast, nor do you want a leather dry piece of chicken that can not be chewed without the aid of a food processor. This chicken was, no joke, fork tender! 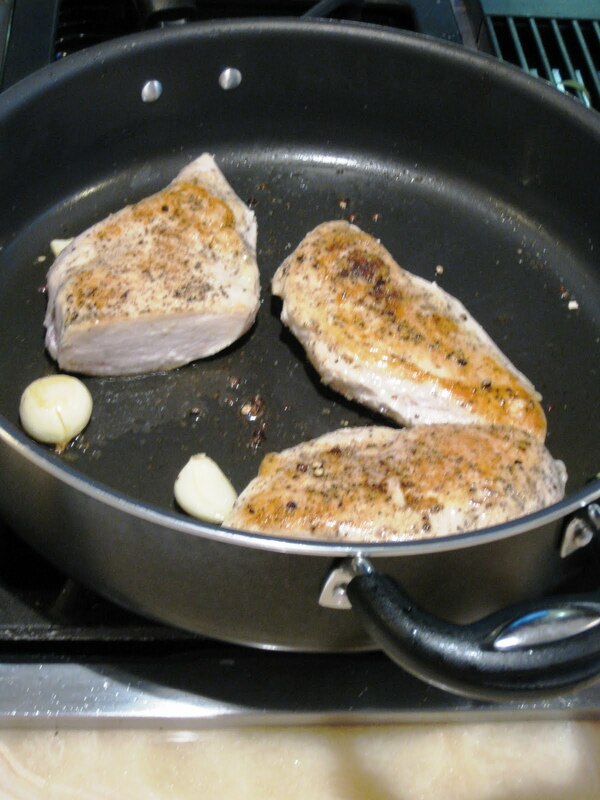 In a way, it had the texture of a perfectly cooked and tender pork tenderloin. The peas were also sous vide, with a little bit of butter, salt and pepper. Notice the beautiful, spring green color – since the peas were not overcooked or overheated, the color was preserved as intended by nature. Speaking of the green, the next course was Green and White Asparagus with 61 Degree Egg and Brioche Croutons and Truffle Butter. This screams brunch! 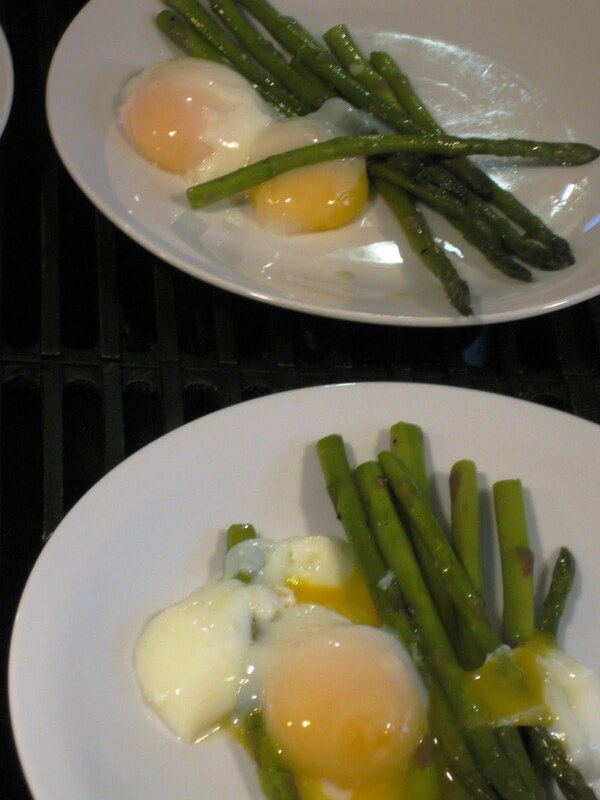 The asparagus is the perfect vessel to dip into the soft egg yolk. I was happy to use the buttery brioche croutons to soak up the rest of the golden, rich goodness. To my surprise, the asparagus was still slightly crunchy. Can you imagine using your sous vide for eggs hollandaise? Just an idea. 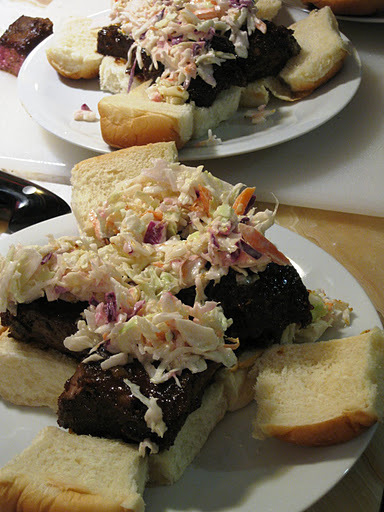 For the next course, I got off my chair and landed a hand in searing short ribs for the Hak’s BBQ Sauce Short Rib Sliders with Cole Slaw, served on Hawaiian rolls. I had two of these! I wanted to pack a few more for breakfast. These were incredible. The short ribs were cooked for 72 hours yet were still medium rare inside. Tender, juicy, slightly fatty, coated in Sharone’s own Hak’s BBQ Sauce these would be the ultimate BBQ dish for your next get together. The tart, vinegary slaw got a topping of crispy bacon bits, both providing the much needed crisp and crunch against the tender meat. Boy, am I happy I don’t keep kosher! And as if this was not enough, next came the king of the tasting menu: Coffee and Pepper Crusted Filet with Fig Infused Pinot Noir Reduction. Perhaps, I shouldn’t be writing this at 10pm, savoring the memories of each delicious bite. 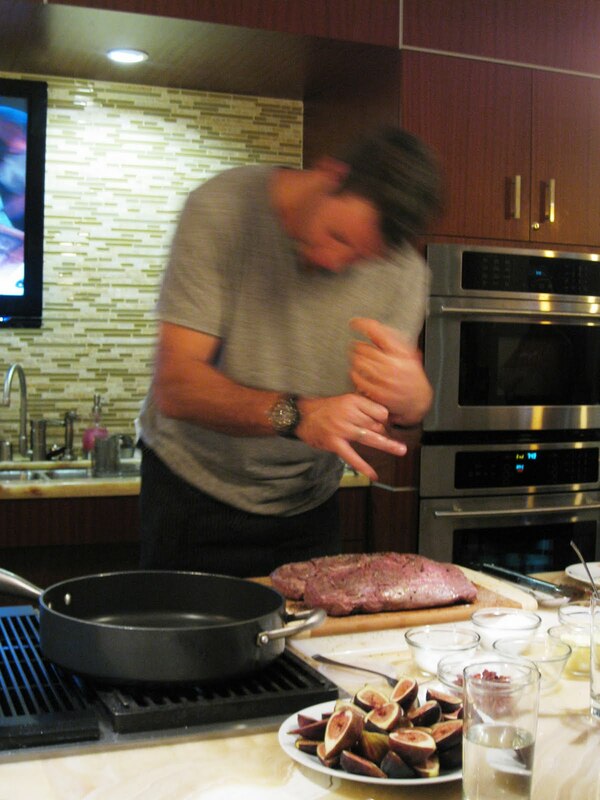 Once out of the sous vide machine, Sharone seasoned the filets with coarsely ground pepper, salt, and coffee grounds (very appropriate for the Seattle audience). The filets were then seared with rosemary and thyme. 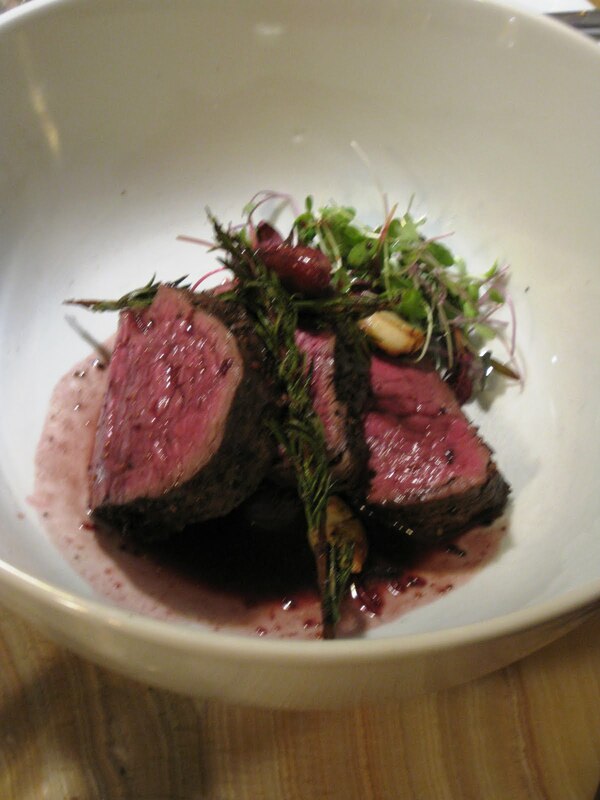 Look at the gorgeous dark mauve color inside, complimented so well by the Pinot Noir reduction. Oh the lucky people who went home with the leftovers! 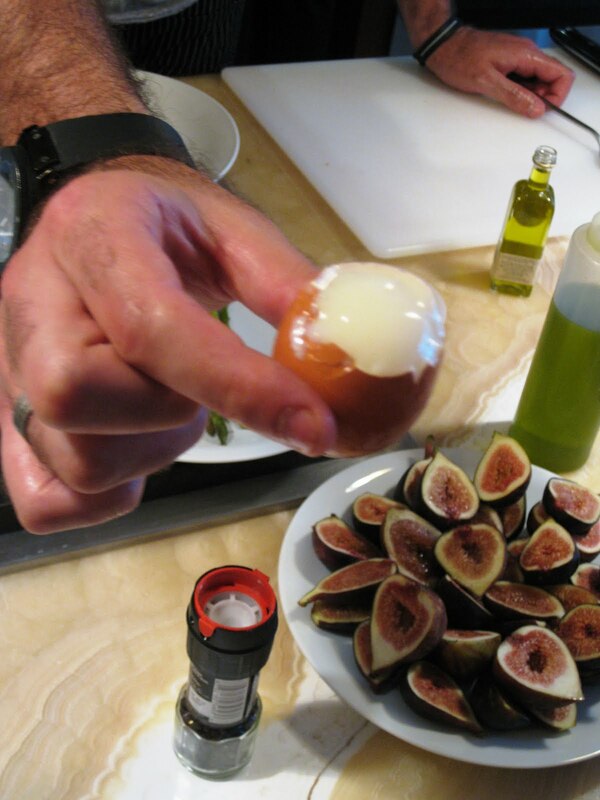 By the way, the gorgeous figs that have appeared in several of the photos above, were also sous vide and served with the filets. And then there was the dessert! Yes, your sous vide machine can help you through the whole meal, starting with appetizers and going all the way to the dessert. 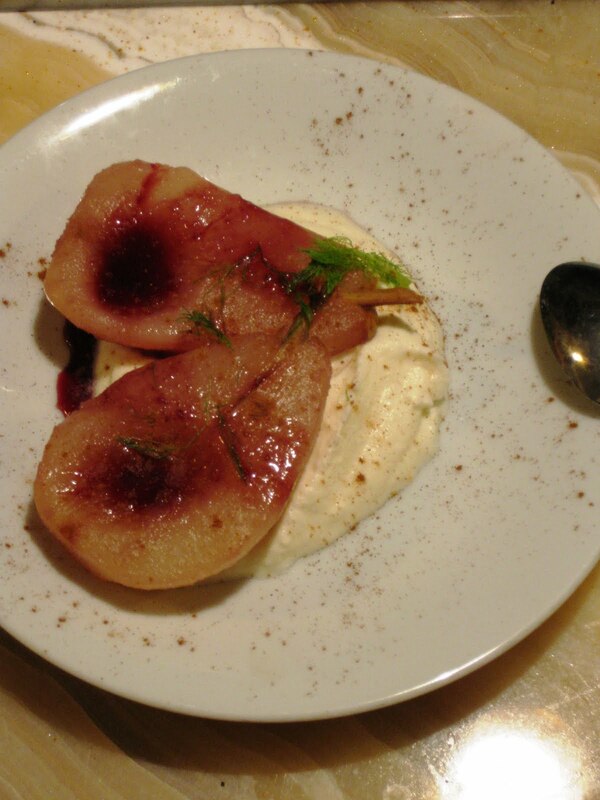 Sharone treated us to Zinfandel Poached Pears with Saigon Cinnamon and Silan Mascarpone. The pears were poached in Zinfandel with a bit of honey and cinnamon. I would’ve loved to have this the next morning for breakfast with a cup of tea. It was the perfect sweet ending to a lovely, lively, delicious, and educational night! So ultimately, why sous vide? Here’s your list of reasons: Simple & Foolproof, Enhanced Natural Flavors, Precise Cooking with Consistent Results, Convenient, Saves Time, and Improves Nutrition. 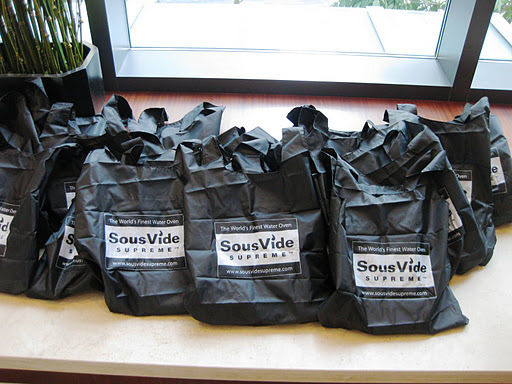 Be sure to check Sour Vide Supreme website for more information, recipes, cooking times and temperatures, and more importantly to find out about different sous vide models available. When it was time to go home, we left with happy stomachs, new friendships, and a bag with Sharone’s BBQ sauce. I would love to hear about your experiences with cooking sous videvide method. How fun! Certainly not like a crock pot, but it sounds like a great way to get tender meat. I can't wait for a chance to try it. And, wow, what a dinner!